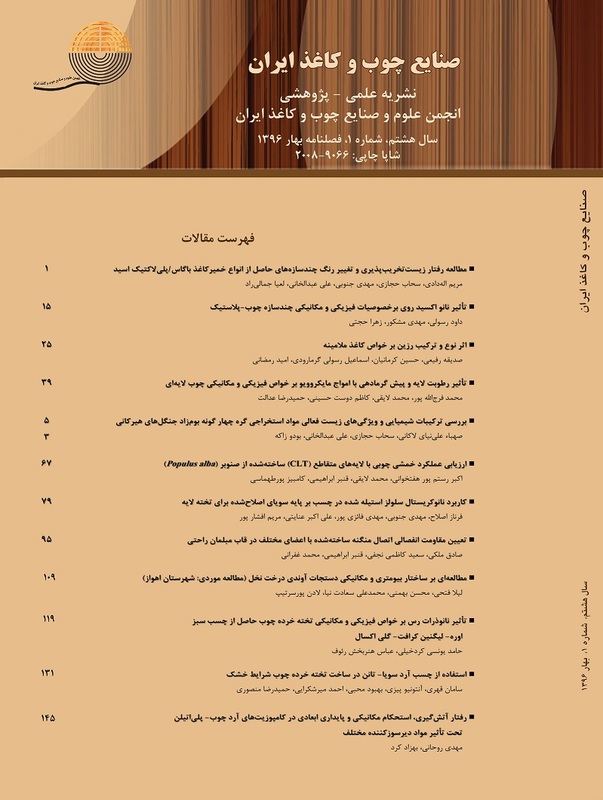 رستم پور هفتخوانی, اکبر, لایقی, محمد, ابراهیمی, قنبر, پورطهماسی, کامبیز. (1396). ارزیابی عملکرد خمشی چند سازه‌های چوبی با لایه‌های متقاطع (CLT) ساخته شده از صنوبر (Populus alba). مجله صنایع چوب و کاغذ ایران, 8(1), 67-78. اکبر رستم پور هفتخوانی; محمد لایقی; قنبر ابراهیمی; کامبیز پورطهماسی. "ارزیابی عملکرد خمشی چند سازه‌های چوبی با لایه‌های متقاطع (CLT) ساخته شده از صنوبر (Populus alba)". مجله صنایع چوب و کاغذ ایران, 8, 1, 1396, 67-78. رستم پور هفتخوانی, اکبر, لایقی, محمد, ابراهیمی, قنبر, پورطهماسی, کامبیز. (1396). 'ارزیابی عملکرد خمشی چند سازه‌های چوبی با لایه‌های متقاطع (CLT) ساخته شده از صنوبر (Populus alba)', مجله صنایع چوب و کاغذ ایران, 8(1), pp. 67-78. رستم پور هفتخوانی, اکبر, لایقی, محمد, ابراهیمی, قنبر, پورطهماسی, کامبیز. ارزیابی عملکرد خمشی چند سازه‌های چوبی با لایه‌های متقاطع (CLT) ساخته شده از صنوبر (Populus alba). مجله صنایع چوب و کاغذ ایران, 1396; 8(1): 67-78. یکی از مقاومت‌های مهم در کاربرد چند سازه‌ چوبی با لایه‌های متقاطع (Cross Laminated Timber) در احداث کف و سقف سازه‌های چوبی چند طبقه، مقاومت خمشی آن است. از این‌رو این پژوهش با هدف ارزیابی مقاومت خمشی CLT‌های ساخته شده با صنوبر انجام شده است. از چسب پلی اورتان به مقدار 300 گرم بر مترمربع در این پژوهش استفاده شده است. ضخامت لایه‌های مورد استفاده در این پژوهش 16 میلیمتر بود. نتایج نشان داده‌اند که با چیدمان 45 درجه لایه ها نسبت به حالت 90 درجه در CLT، مقاومت و مدول الاستیسیته خمشی در جهت طولی CLT ساخته شده به ترتیب به میزان 14 و 15 درصد افزایش می‌یابد. همچنین نتایج نشان داده‌اند که مقاومت و مدول الاستیسیته خمشی CLT متاثر از پهنای لایه های آن است و مقاومت و مدول الاستیسیته خمشی در جهت طولی نمونه CLT ساخته شده از لایه‌های با پهنای 4 سانتیمتر به ترتیب 14 و 5 درصد بیشتر از CLT‌های ساخته شده با لایه‌های با پهنای 9 سانتی‌متر بودند. از این‌رو، با توجه به نتایج می‌توان گفت با چیدمان لایه‌ها به صورت 45 درجه و لایه‌های با پهنای کمتر می‌توان از چوب تند رشدی مانند صنوبر، CLT با مقاومت‌های قابل قبول ساخت. Mohammad, M., Gagnon, S., Douglas, B.and Podesto, L., 2012. Introduction to cross laminated timber. Wood Design Focus, 22(2): 3-12. Gagnon, S., Pirvu, C., 2011. CLT handbook: cross-laminated timber. FPInnovations Québec. Association, A.T.E.W., 2012. Standard for performance-rated cross laminated timber. ANSI/APA PRG, 320. Robertson, A.B., 2011. A comparative life cycle assessment of mid-rise office building construction alternatives: laminated timber or reinforced concrete, MSc thesis, University of British Columbia. Harrison, S.K.and Hindman, D.P., 2007. Test method comparison of shear modulus evaluation of MSR and SCL products. Forest products journal, 57(7/8): 32-38. Kim, H. K., Oh, J. K., Jeong, G. Y., Yeo, H. M.and Lee, J. J., 2013. Shear performance of PUR adhesive in cross laminating of red pine. Journal of the Korean Wood Science and Technology, 41(2): 158-163. Park, H. M., Fushitani, M., Sato, K., Kubo, T.and Byeon, H. S., 2003. Static bending strength performances of cross-laminated woods made with five species. Journal of wood science, 49(5): 411-417. Buck, D., Wang, X.A., Hagman, O.and Gustafsson, A., 2016. Bending Properties of Cross Laminated Timber (CLT) with a 45° Alternating Layer Configuration. BioResources, 11(2): 4633-4644. Mohamadzadeh, M.and Hindman, D., 2015. Mechanical Performance of Yellow-Poplar Cross Laminated Timber, Virginia Polytechnic Institute And State University, Department of Civil and Environmental Engineering, Blacksburg, Report No. CE/VPI-ST-15-13. Kramer, A., Barbosa, A.R., Sinha, A., 2013. Viability of hybrid poplar in ANSI approved cross-laminated timber applications. Journal of Materials in Civil Engineering, 26(7): 1-5. Dinwoodie, J. M., 2002. Timber: its nature and behaviour. CRC Press. American Society for Testing and Materials., 1999a. “D 143-94: Standard Methods of Testing Small Clear Specimens of Timber,” in 1999 Annual Book of ASTM Standards, Section 4, Vol. 04.10: Wood. Hochreiner, G., Füssl, J., Eberhardsteiner, J.and Aicher, S., 2014. CLT plates under concentrated loading–Experimental identification of crack modes and corresponding failure mechanisms, Materials and Joints in Timber Structures. Springer, RILEM Bookseries 9: 703-712. Zhou, Q., 2013. Development of evaluation methodology for rolling shear properties in Cross Laminated Timber (CLT), MSc thesis. University of New Brunswick, Fredericton, NB. Zhou, Q., Gong, M., Chui, Y.H.and Mohammad, M., 2014. Measurement of rolling shear modulus and strength of cross-laminated timber fabricated with black spruce. Construction and Building Materials, 64: 379-386. Li, M., Lam, F.and Li, Y., 2014. Evaluating rolling shear strength properties of cross laminated timber by torsional shear tests and bending tests. World Conference In Timber Engineering, 10(18.5): 280. Ebrahimi, Gh., 2013. Mechanics of wood and wood composites, 4th Ed., University of Tehran, 657 p.